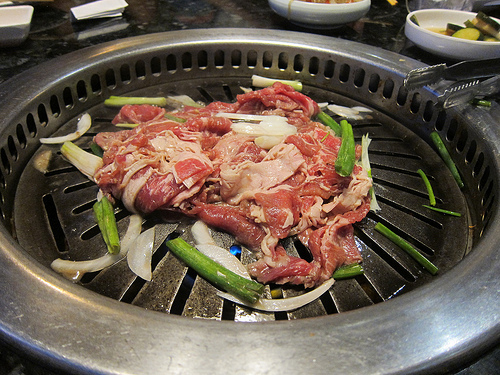 I had a hankering for Korean BBQ and have been meaning to try out some new places in Koreatown. 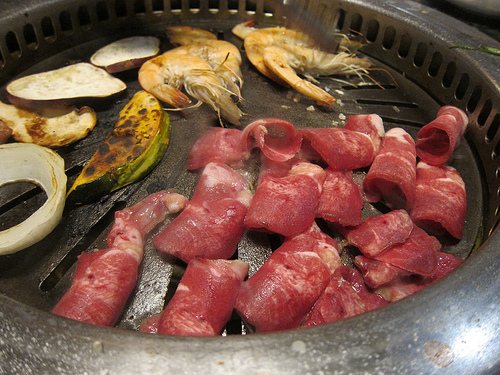 It seems like every few feet there’s a new KBBQ place opening in Ktown. 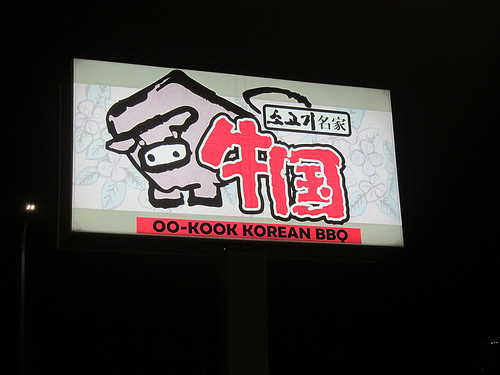 Oo-Kook came recommended and despite its cute cow logo, they offered more than beef. 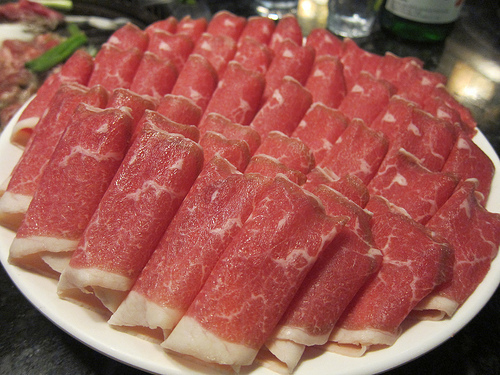 Oo-Kook is pricier than your average all-you-can-eat place but they have a long list of cuts of meat to choose from. I think $25 for AYCE is a great deal. After waiting almost an hour, we were seated at a booth. 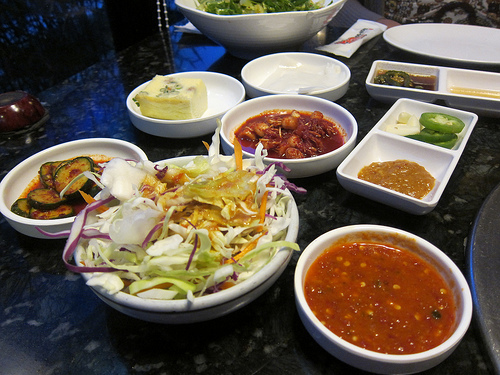 The banchan (pickled appetizers including kimchi) were adequate. I was a bit confused by the kimchi green onion roots but waste not, want not? I was pleased to see the sauces automatically included chili sauce and doenjang (fermented bean paste) in addition to gochuchang (red pepper paste). We also got a huge bowl of salad which they refreshed without us asking. I always like to start off with chadol (brisket) though friends I was with wanted the marinated stuff right away. I tend to get the unmarinated stuff first because you don’t have to clean the grill so often but they assured me that’s what the button is for. Tables are equipped with call buttons so you can ring for service. I got a bottle of soju to share but my friends stuck to soda. 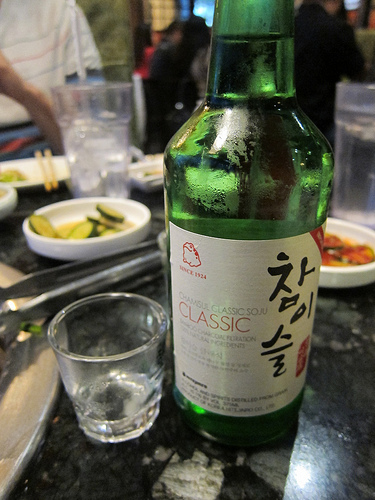 It’s a good thing I like soju and this is fairly low-proof. I have to admit the marinated kobe was good. We got a second order. We also got all the pork belly types- I didn’t taste the difference in marinades and would only get this again if someone insisted. I do like grilling it for a while to get it crunchy. We got an order a shrimp and ended up getting a second since it only came with 5 shrimp per order. It’s a good thing it’s all-you-can-eat! 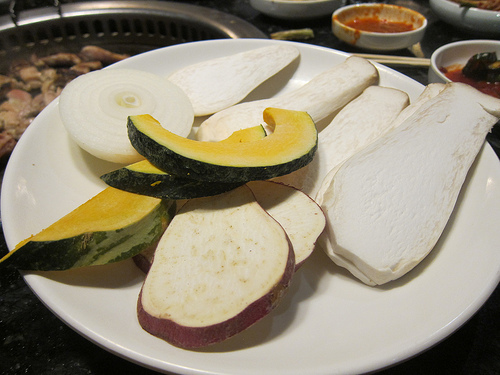 My friends wanted to get the veggies but after we grilled the dish of mushrooms, onion, eggplant and kabocha squash, I didn’t think it was worth it. I could have had more meat! We also got chicken (not shown) and tongue. 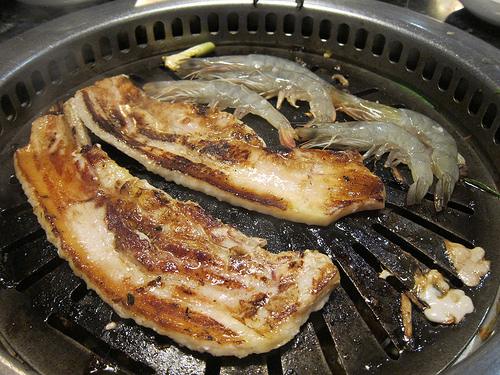 One day I hope to go back with KBBQ fans and try more of the beefy cuts. It was good though to try a little bit of everything. Usually I roll out of KBBQ feeling like I’m up to my eyeballs in smoke and meat but I felt sort of okay afterwards. It must have been the power of the soju.